KIEV, Ukraine -- The civilian and military death toll in the conflict in eastern Ukraine is estimated to have surpassed 6,000, with hundreds killed in fighting in the past few weeks, according to a new report by the United Nations released Monday. Soldiers of the Ukrainian armed forces sit in a self-propelled howitzer near Artemivsk, eastern Ukraine, on March 2, 2015. 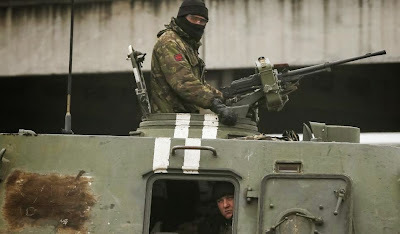 The conflict first began in April 2014, when pro-Russian separatists took control of buildings in the eastern Ukrainian regions of Luhansk and Donetsk following the Russian annexation of Crimea. Since then, Ukrainian government forces have battled Russia-backed rebels, resulting in a huge number of humanitarian casualties. Russia denies backing the rebels. The latest in a string of largely unsuccessful cease-fires went into effect February 15, but both sides have accused each other of flouting the agreement. Despite the attempts at a cease-fire, the deaths show “merciless devastation of civilian lives and infrastructure” in eastern Ukraine, U.N. High Commissioner for Human Rights Zeid Ra’ad al-Hussein said in a statement. “It is imperative that all sides comply with the provisions of the Minsk Agreements and halt the indiscriminate shelling and other hostilities that have created a dreadful situation for civilians, in stark disregard of international humanitarian law and human rights law,” al-Hussein said. On Monday, U.S. Secretary of State John Kerry accused the separatists of taking a “piecemeal” approach to the cease-fire. The U.N. report, the ninth on the conflict in Ukraine since it began, focuses on the period from December 2014 to February 15, 2015. The situation for civilians during January and February “rapidly deteriorated” from a relatively quiet December, with fighters and arms, including those backed by Russia, continuing to enter the region, according to the report. More than 14,740 people have been wounded in Ukraine since mid-April 2014, and 1,012 were killed between December and February alone, according to estimates by the World Health Organization and al-Hussein’s office. Included in the report are allegations of arbitrary detention of civilians, enforced disappearances and torture. “The arbitrary detention of civilians regrettably remains a feature of the hostilities, including for the purpose of prisoner exchanges,” the report says. “Many of those killed (especially members of armed groups) have been buried without being taken to morgues, and insecurity prevented many wounded people from accessing medical establishments,” the report says. On Monday, Kerry met with Russian Foreign Minister Sergey Lavrov in Geneva to discuss the crisis in Ukraine, days after Boris Nemtsov, a prominent critic of Russian President Vladimir Putin, was shot dead in Moscow.